Passcape ISO Burner (PIB) has only been mentioned here once before -- by I am Baas in a rather unfavorable context (http://www.portablefreeware.com/forums/ ... 453#p36453) -- but, according to its homepage, appears to be natively portable ("No installation required, the program does not write anything to your hard disk or registry"; untested!). 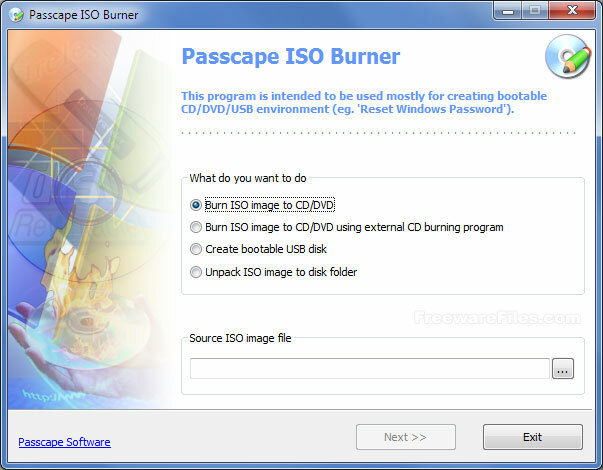 [url]http://www.passcape.com/passcape_iso_burner[/url] author wrote: Passcape ISO Burner was developed for creating bootable disks from available ISO images. PIB is compatible with the majority of CD/DVD recorders and USB devices, (including Memory Stick, Compact Flash, SmartMedia, Secure Digital, USB flash drives, USB ZIP drives, USB Hard Disk drives, etc.) The application's Spartan interface is ultimate-simple and oriented toward the inexperienced user. Download PIB current release (v1.4.0?) from http://www.passcape.com/index.php?secti ... y=27&id=40. Free for home (non-commercial) usage. I do not appreciate your comment; it was not just a mention... you make it sound like the time and effort that I put into exposing Martik was insignificant. Also, I did say in a subsequent post that I recognized the portable software, i.e. I either used or tested it before. Mind you, not every portable software has to be in TPFC database. Sorry for my comment, I didn't want to offend you. As you see, it's still "suggested by: I am Baas".